At my office I've been connecting a Sony 20" 1600x1200 LCD monitor to my Powerbook. However, this only lets me put two 80-column Terminal windows side-by-side. There's more horizontal space, but not enough for a third 80-column terminal. (Not at my preferred font size, anyway). So I ordered a Dell 2405FPW, which is 24" and 1920x1200. It has enough room for a third terminal. 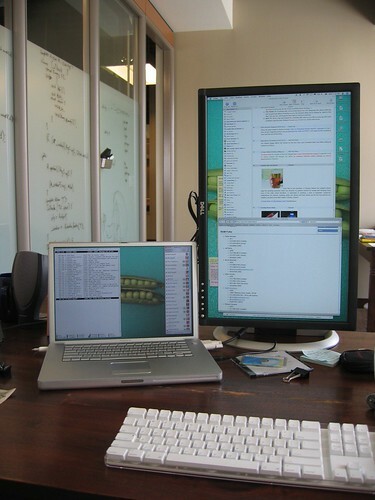 Most of the other LCDs around the office are Apple displays, but the Dell displays have a few advantages. First, they're cheaper. Second, the Dell stands are much more flexible. Third, the Dells have four USB ports. Fourth, the Dells support VGA, S-Video, and composite video inputs in addition to DVI. The 2405FPW also supports component video and has four memory-card reader slots. The only advantage of the Apple monitors is that they have a Firewire hub, but nobody here needs that. My 2405FPW arrived Tuesday. The stand is height-adjustable and rotates, unlike the Apple stand. 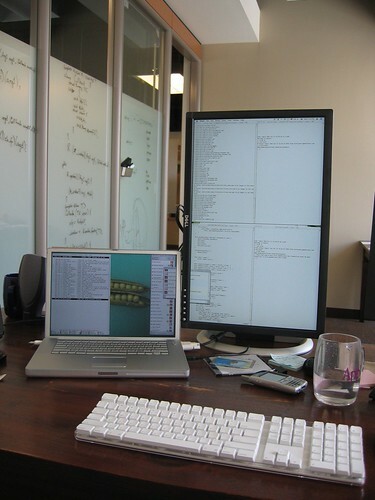 In addition, it supports rotating the monitor 90 degrees, into "portrait" orientation. MacOS X supports this (you set it in the Displays system preference pane), so I decided to try it just for fun.